Patagonia stood out for its truculence. Outdoor clothing company Patagonia didn’t hesitate when US President Donald Trump announced Monday that two national monuments in Utah — Bears Ears and Grand Staircase-Escalante — would be reduced by millions of acres, the largest reduction of federally protected land in the country’s history. The executive order opens up large parts of these monuments to potentially harmful industrial activity, according to environmental groups like the Naturall Resources Defense Council. Right away, Patagonia responded by changing their homepage to a black background with stark, accusatory text. The Trump administration, meanwhile, defended the reduction as a way to stop federal overreach. Patagonia’s intention to challenge the executive order means that it will join various environmental organizations, Native American groups, and outdoor clothing companies that have also vowed to sue the administration. Other companies have denounced the executive order as well, according to CNN. Clothing brand North Face, for example, is donating $100,000 for an education center in Bears Ears, Canadian company Arc'teryx is donating $30,000 to groups challenging the order, and outdoor gear company REI voiced its support for national monuments. Patagonia stood out for its truculence, however, which is typical for a brand that has staked its reputation on sustainability and conservation. As an outdoor clothing company, Patagonia is invested in ensuring environmental integrity. The Outdoor Industry Association estimates its revenues at $887 billion annually and suggests that the president’s decision will lead to millions of lost dollars. Patagonia’s commitment to conserving public lands also go beyond financial considerations. In fact, 1% of its sales go to supporting environmental groups and the brand’s founder is an iconic outdoorsmen. “For us at Patagonia, a love of wild and beautiful places demands participation in the fight to save them, and to help reverse the steep decline in the overall environmental health of our planet,” the company’s mission statement reads. In explaining their response to the executive order, the brand outlined four reasons why reducing the two monuments doesn’t make sense. First, Patagonia said that selling off public lands is an existential threat to the outdoor and recreation industry, which supports 7.6 million jobs, because the vast majority of related activity takes place on public lands like Bears Ears. Next, the brand said that states are poor guardians of public lands. Historically, 70% of federal public lands that have been handed over to states have been sold off to private interests, Patagonia notes. Further, Patagonia argues that public lands are already open to industrial activity and that there are currently more than 7,500 drilling permits that are waiting to be used, so there’s no need to open up more lands. Finally, the brand said the public overwhelmingly supports public lands. In fact, when Ryan Zinke, the Secretary of the Interior Department, opened his review of national monuments to public comments, nearly 3 million poured in, the vast majority in favor of protecting them. 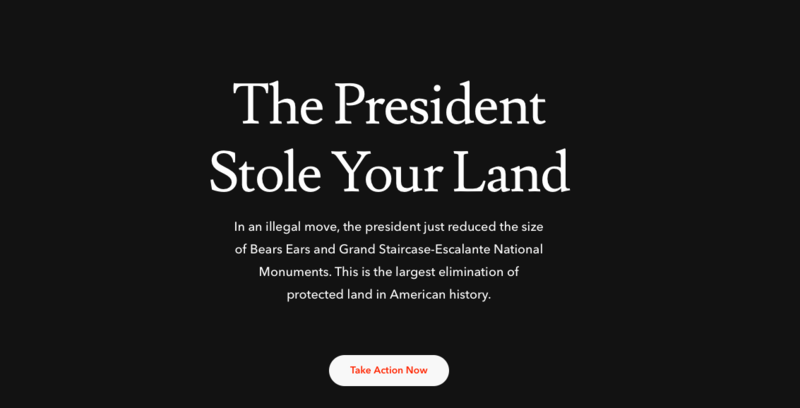 For those interested in protecting the lands, Patagonia called on people to take action. Other organizations, such as the Natural Resources Defense Council also have ways for people to take action. Global Citizen advocates on the Global Goals, which call for protecting the environment. You can take action on this issue here.